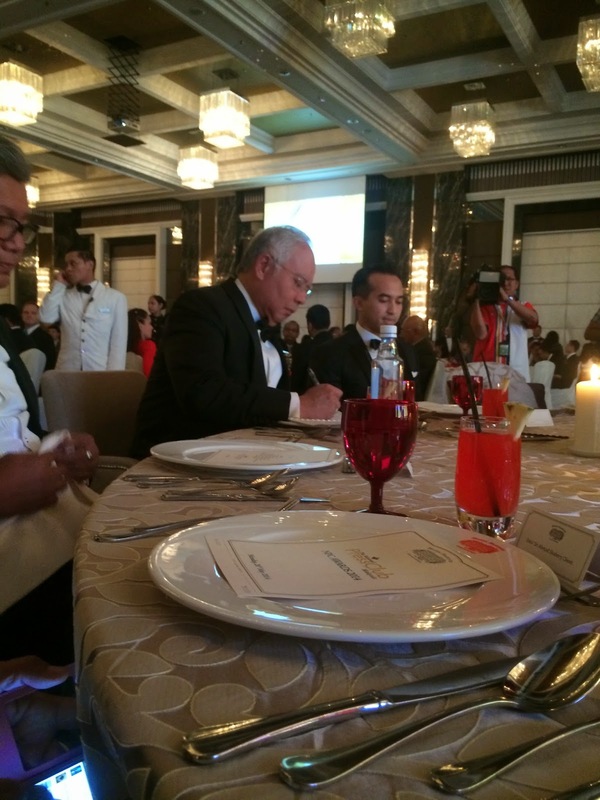 Spiritual journeys and my last NPC Awards: The first thing Najib Razak asked me as he got out of his Perdana at the Majestic Hotel was: "How was your trip?" He was referring to my motorcycle expedition to the Holy Land that ended just last week. "Spiritual, Sir," I replied and, aware that the PM leaves for China today to mark 40 years of bilateral ties started by his father and our second Prime Minister Tun Abdul Razak, I added, "China, especially, awesome." Later over dinner, after having given away prizes for the eight major winners at the National Press Club Awards, he asked if my Kembara Bumi Suci riders had covered Xian, one of the places he would be visiting. You could see his excitement about the upcoming visit. "It must be close to spiritual, Sir, this visit of yours to China," I said. "Yes ... and emotional," he answered. The two months that I hadn't been blogging (72 days to be exact) were the longest time away from the keypads. The KBS had left KL on March 14 (Najib had launched the project a few days earlier at Sri Perdana) and we arrived in Madinah 61 days later after covering more than 17,000 km (of land, sea and even air; tarmac, sand and ice) and 12 countries. After performing the Umrah, I flew back early last week ahead of the team in order to help organise the NPC Awards; I have been the Organising Chairman since its inception in 2011. The evening went well, the hall was packed, the sponsors happy and we got Shabery Cheek's ministry to come on board for the first time. Najib's take on today's journalism was honest, especially the part of his speech about being forced to drag unscrupulous media practitioners to Court. Government and Opposition politicians do it (sue journalists and media organisations); it's part of the democratic process, he said. It's a balance between allowing for a liberal media and a need to keep one's good name against journalists who defame because of their own political agenda. Welcome back bro. You have no idea how much we miss you. You know what dude. Your continental trip reminiscing of Che Guevara motorcycle trip in Latin America. He recorded it in his famous diary. The long, exhausted expedition was an eye opener to him. He saw what an ugly and wick little world we lived in. It made him abandoned his physician job and joined a guerrilla. Toppling government via revolution. Ah yes, on the Norton 500. Accidental revolutionary man, our Che. I'm twice his age when he did that expedition with his best friend, also a doctor. They were crazy! The pics posted in Israqadventure on Kashgar brings back memories when I was there in the 90s.No we didn't ride our bikes there(Kapcai pun saya tatau bawa )It was an express bus that took us across the desert from Urumqi to Kashgar.Still, it was the most memorable journey for me.The Id Gar mesjid at that time had more madrasah for 200 students.Wonder if it is still there. Semoga penghijrahan Tuan2 semua di berkati ALLAH. Looks like you guys had a great journey. Let's wait for you to blog about some of the adventures encountered along the way! Alhamdullilah you are back already bro. Datuk, WELCOME, WELCOME back. I am so pleased to read your piece today. Have been missing it - was always checking to see whether you were back. You and your team must have had such a memorable journey through such varied landscapes. Hope you do a special piece just on this trip. Bet you were surprised to see millions of Chinese Muslims who are not like those in Malaysia or the mualafs type. And the Cina Komunis are not as what you perceived to be? You introduce yourself as Melayu first or Malaysian? Just curious? Alhamdulillah....good to have you back and blogging again. its never the same without Rocky Bru in the cyber space! I introduced myself as Malaysian wherever I went. And most people in the countries we visited would assume, upon being told that we were from Malaysia, that we must be Muslims as well. Outside China, some of us were mistaken for Chinese or Japanese. Quite often, people thought we were Thais or Filipinos. When you tell them you are a Malaysia, they would ask the same question" "Musulman?" And when you say yes, you are a Muslim, they would say "Alhamdulillah" and asked if you have had dinner. Often, someone would volunteer to pay for what we consume. "Reminiscences of the Great Tang Dynasty"
Welcome back home bro. God Bless. Welcome home Datuk. Umrah Mabrur. Miss your quality posting. Hope you come back a bit more wiser, honest and virtuous instead of brandishing your usual tainted image of being a paid defender of the corrupts, racists and the extremists. Welcome back! Every single day I visited your blog hoping to read a new article. I'm so happy you are back. Some pro-opposition cybertroopers commented that you had stopped blogging because your paymaster aka UMNO had stopped paying you! The RBAs think that you are like them! Mengapa kebelakngan ini apabila membaca Malay Mail seperti membaca portal Malaysiakini banyak artikel memburuk-burkkan UMNO. Here's hoping against hope that you and Co will learn to appreciate views that don't agree with yours and, once in a while at least, accept the truth even if it hurts … Amin. Thank you Ketua Kampung, Anon fr Miri, NorAzhar, Eddie, Annie, Mike Scorpion … It's good to be back to blogosphere. Welcome back bro.Insyallah you have umrah mabrur. Looking forward to yr future posting. Very curious how much funding did you get from PM Dept......??? Patutlah, nak syok organize another trip, why don't you start writing good policies on good governance ??? Bertaubatlah , bila lagi ........ah ,, songlap, sini, songlap sana ..........cukuplah. Anyways, each Kembara Bumi Suci participant paid RM55k to be part of the expedition. The fee covered his accommodation in over 50 towns/cities, motorcycle maintenance, some food and beverage, transportation such as bus/lorry transfers, visas, uniform, admission tickets (museums, parks etc), air fares, and shipping including the Ro-Ro from Turkey to Egypt and Egypt to Amman. The organisers managed to get some sponsors - their names and stickers are all over our uniforms and our bikes, if you want to look them up. The documentary they are working on based on the Expedition wlll be shown on RTM this Ramadan. Hopefully it will get a million audience, you included. sore-loser anons will always be around..
What kinda of weed you've been smoking man. Where did you get all the info about them being funded from the PM's Dept. That's the reason why you should stop mingle with the fuckutan people. They're lowering your capabilities to think wisely. Pity you bro.